Undeterred by Curtis's plea for prudence (see "What I Know About Horace Greeley"), Nast moved directly to challenge Morgan's portrait of Grant as the uncomfortable schoolboy. 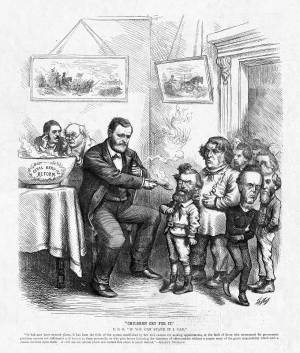 In "Children Cry For It," President Grant is feeding a steaming bowl of "Civil Service Reform" gruel to a group of unreceptive Liberal Republicans, with Grant remarking, "If You Can Stand It I Can." The lower caption is excerpted from Grant's annual message to Congress of the previous December, in which the president endorsed civil service reform.